They are the same shape and size of many of the puffball examples listed in the last Monthly Mushroom post, but few amongst even the most passionate woodland wanderers tend to get too fired up by the sight of an Earthball. Their ubiquity is matched by their unobtrusive drabness. To the glancing eye, the Earthball basically looks pretty much like a puffball past its prime and gone to spore. At no stage in its lifecycle would you ever consider putting one anywhere near your mouth. Even if considered edible, which it definitively isn’t, you would be hard pushed to get your teeth through its tough peridium - which if you recall last month’s puffball discussion, refers to the outer skin - hence the Latin name for this genus of Scleroderma (‘hard’ + ‘skin’). The “thick, hard, leathery rind” described by R.T. and F.W. Rolfe in The Romance of the Fungus World from 1925 is the key feature that distinguishes Earthballs from Puffballs. The Common Earthball (Scleroderma citrinum; also been referred to by the synonym S. vulgare) is a dirty yellow or ochre in colour, hence the citrinum part of its Latin name (i.e. like a lemon) and the alternative common name of Citrine Earthball. But its coarsely scaled outer layer has given it a further name, the Pigskin Poison Puffball. The middle part of this descriptor should also be enough to spell out that the best you can hope for should you fail to make the distinction is hours of stomach cramps and vomiting. Curiously the Rolfes claim another name for it, the “False Truffle". "It is used as a substitute for the real article in various dishes, being collected in Epping Forest by gentlemen from Soho; but, as with the Red Truffle, is of very inferior flavour in comparison with the true truffles.” Well, if the smell of the Earthball doesn’t put you off, you certainly won’t want to be confusing Earthballs with Truffles after reading up on their toxicity . The fruiting body of the Common Earthball is usually 3-10 cm wide. It is slightly flatter compared with that of a Common Puffball and lacking its characteristic lightbulb shape. Rather than grow out of its substrate, it is instead attached to it by chord-like mycelial threads. If you prod it, push it or pick it, you’ll quickly notice that it has a different, heavier density. Cut it in half and you’ll see that the interior, or gleba, is at first white in very immature specimens but quickly turns a purplish black patterned with whitish veins, vaguely like a bisected fig, then becomes brown and powdery as the spores form. The spores are released when the fruit body bursts asunder. 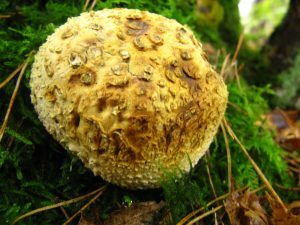 This also distinguishes them from many of the puffballs, which gush forth their spores through the rather more clearly defined ostiole or operculum. The comparative ‘apical pores’ of the Earthball, the holes from which the spores are released, are a lot messier, essentially irregular ruptures in the peridium rather than neatly formed apertures on the top. Michael Kuo on MushroomExpert.com claims that around 25 species of Scleroderma have been described worldwide, and a (complete?) list can be found on Wikipedia. Scleroderma citrinum is by far the most commonplace in the UK. Roger Philips, in his exhaustive Mushrooms and Other Fungi of Great Britain & Europe (which proudly bares on its front cover the subtitle The Most Comprehensively Illustrated Book on the Subject this Century) has photos of just two others; S. areolatum and S. verrucosum, as does my personal favourite illustrated guide, Gerrit J. Keizer’s The Complete Encyclopedia of Mushrooms. 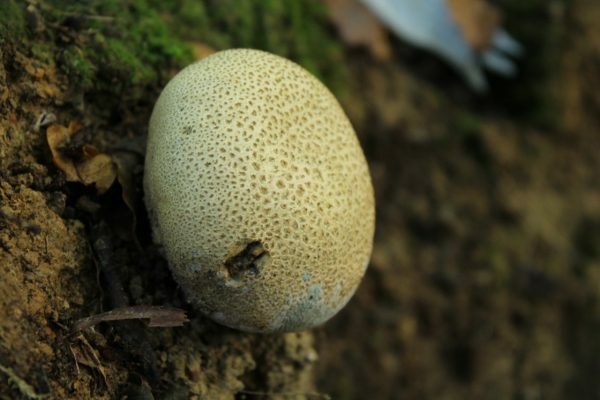 S. areolatum can be identified by smaller, finer scales surrounded by a ring: Philips describes the pattern as “dotted, reticulate” and Keizer as “leopard-skin”, hence the common name listed for it by the British Mycological Society, the Leopard Earthball. S. verrucosum (the verrucosum part means warty), or the Scaly Earthball, has something more of a stem to it than its more bulbous relatives. 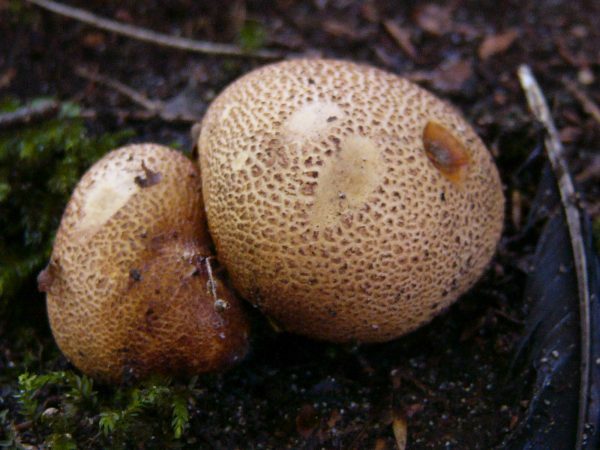 According to Shelley Evans and Geoffrey Kibby’s Pocket Nature: Fungi (2004), S. Bovista, or the Potato Earthball, the only other Scleroderma listed as having a common name on the BMS website, “prefers less acid ground and has a smoother, greyer surface with a thin skin” to the Common Earthball. But basically, it doesn’t seem like there is a huge amount to go on when distinguishing such species as these from one another, nor the myriad others that can be found around the globe. 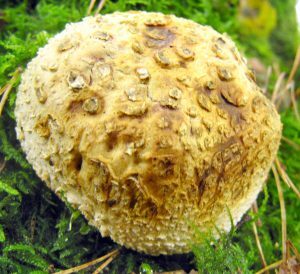 Scleroderma seem to share more than they differ, however, and one commonality seems to be their adaptiveness to a wide range of habitats, from grasslands, avenues and mixed woods to rotting wood and beds of moss. 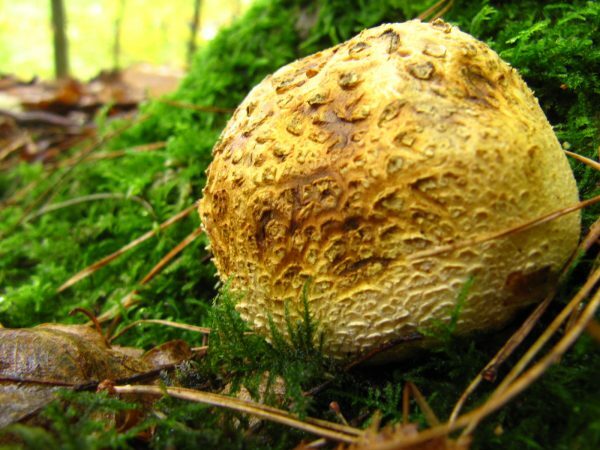 The Common Earthball seems to favour acid but also sandy soils, as Philips says, “mossy or peaty grounds ground on heaths or in rich woodland, especially on sandy soil.” In other words, they can be found growing in fairly dry-ish conditions such as around this time of year. Bizarrely, there is a species of bolete, the Parasitic Bolete (Pseudoboletus parasiticus) that seems to have evolved to exclusively grow on Common Earthballs, proof that even the most seemingly unassuming and unlovely of nature’s creations has a value to something somewhere within the larger ecosystem. It is well worth remembering, because if you are out for a forage, you are more than likely to come across a Scleroderma, and if you do, they certainly warrant a second look, as they are a lot more interesting than one might first give them credit.